– they are good for the local economy. For each pound spent in an Independent you support more local jobs than if you spend it in a chain. – they keep our High Streets diverse and full of character. – unless our independent food shops survive then local farmers, and the regionally important St Philips fruit and vegetable wholesale market will not survive either, which will mean the loss of lots of local jobs and local entrepreneurship. Visit the retail centres page on the Bristol City Council website for details of the city-wide retail areas and local trader’s associations. Not to be left behind here in Bristol, the Bristol Food Network, in partnership with the Bristol Food Policy Council, the Bristol Green Capital and Destination Bristol, launched a campaign in 2011 to highlight the city’s rich legacy of diverse independent retail and vibrant high street shopping centres. The campaign will partner with the Bristol good food initiative developed by the Food Policy Council. 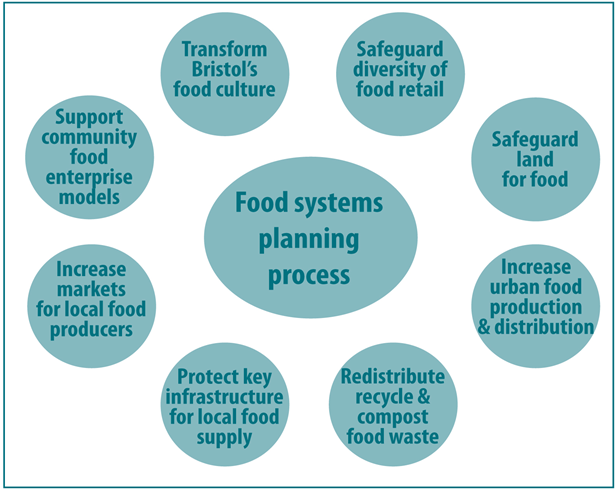 This builds on and extends the recommendations of the Who Feeds Bristol report, commissioned by Bristol Green Capital, NHS Bristol and the Bristol City Council. One of the Who Feeds Bristol recommendations is to safeguard the diversity of food retail in the city. The initiative will include many more independent businesses and high streets in Bristol for Independents Day on 4 July 2012. Why support local independent businesses and traders in Bristol? Bristol has around 180 specialist independent food shops owned by 140 businesses that sell food from which you can cook a meal from scratch (includes bakers). 10 out of 35 wards have no greengrocer. Half the wards have less than 10 independent food retailers. Specialist independent food shops are disappearing. They generally offer competitive prices, don’t charge a premium for small volumes and can respond to requests; many buy from local suppliers. Who we are: The Bristol Independents campaign is mainly (although not exclusively) powered by Jane Stevenson, Kristin Sponsler, and Joy Carey, all of the Bristol Food Network. As I thought – nothing local as far as I’m concerned. Bristol doesn’t end at Stapleton Road, although this site might give you that impression. Why don’t you include non-food Independents? We are a small, perfectly formed Herbal Apothecary & Natural Health Clinic – there isn’t another one of us anywhere!! thankyou very much for the certificate that i recieved today.I am very honoured! Had some great butcher-made beef burgers and onions hot from the grill at M.J. Dalton’s Gloucester Road (Memorial Ground end) on Saturday – its becoming a regular treat for the family.